Tonight’s dinner starts with boxing with Kendra, has an pigeon capture in between, and ends in #seabassparsnipsstrawberriesandtruffleandwinethankyouverymuch. It was a very eventful evening! Kendra and I decided we’d challenge ourselves with Intermediate Boxing at the Polk Street Boxing Gym (don’t be impressed – I’m terrible and hid in the back) and then we assisted in the capture and release of a pigeon who was attempting to have coffee at the Blue Fog Market. Since it was such a big night and I literally saved the life of the rare and valuable street pigeon, I felt I deserved some delicious and semi-buttery food tonight. Boil parsnips in salted water until fork-tender (about 15 mn). Puree in a food processor with remaining ingredients and salt & pepper to taste. The best finishing salt here is Fusion Truffle Salt, which you can order online here or find in Washington specialty grocery stores. This was an idea I came up with after having a much more complicated (and, if I have to be honest, tastier) version at Verbena SF. Their version is an incredibly delicious and delicate version involving juicing beets and using in-house fermented mushrooms. My version is the much easier version. While I recommend you go to Verbena for their beet & strawberry salad (and everything else on their menu), I recommend you cook this easier version. Roast beets in olive oil, salt and pepper in oven at 450 degrees for approximately 30-45 minutes or until tender. I usually wrap them in aluminum foil for easy cleanup and great steaming. Heat olive oil in a non-stick pan over medium-high heat and add turnips. Mix quickly until wilted and remove from heat. 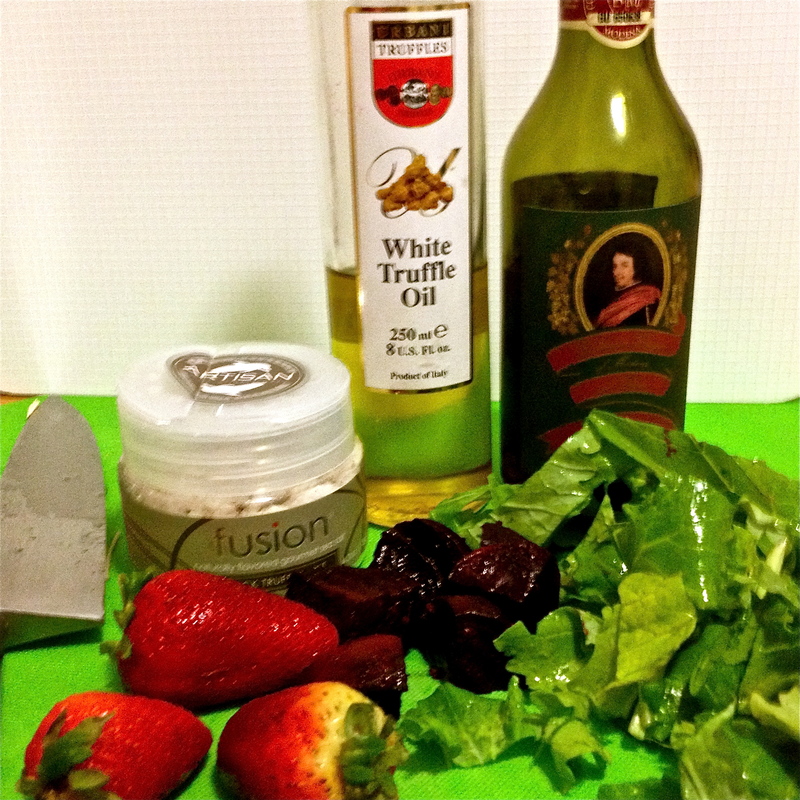 Add strawberries, balsamic vinegar and salt and mix until ingredients warm slightly. Finish with a small squeeze of lemon. Ok, here’s where I get really controlling and tell you some instructions over and over until you listen. 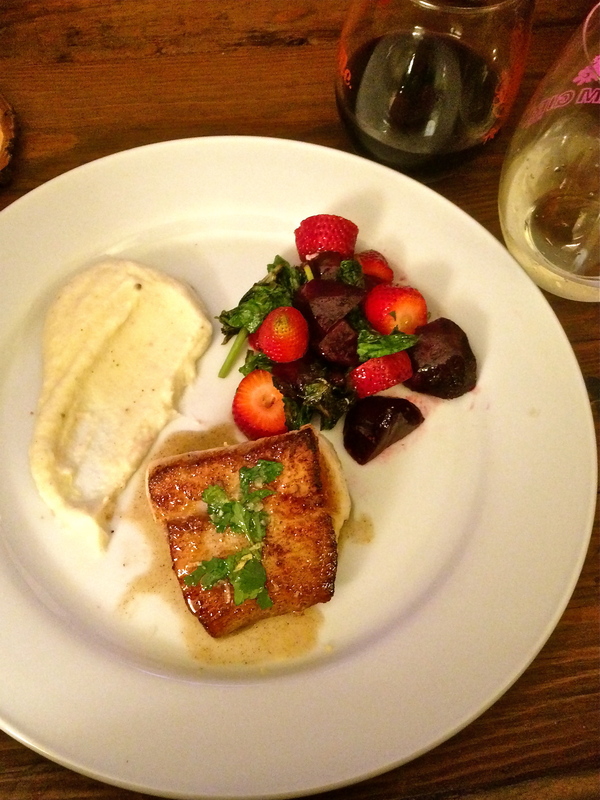 I’m not trying to be controlling (I am), but there are three steps to perfectly searing fish. Ready? Ok! Salt & pepper your DRY, CLEAN fish and set aside for about 10 minutes. If it’s not dry and clean, water will get into the pan and steam, not sear your fish. And if it’s not salted beforehand, it won’t be seasoned all the way through the meat. Heat the grapeseed oil and 1 tsp butter in a pan until HOT. I mean like REALLY hot. I mean like put the burner on almost high, wait until the butter turns a flaky brown color and then wait some more. If the pan is not smoking it will not sear the fish like you want. I can not emphasize this enough. HOT HOT HOT. Like, worried you’re going to set off the fire alarm ok? Got it hot? Ok. NOW you may proceed post my controlling rant. Add fish to freaking hot pan and NO TOUCHY. Don’t move it. Don’t shake or try to flip. 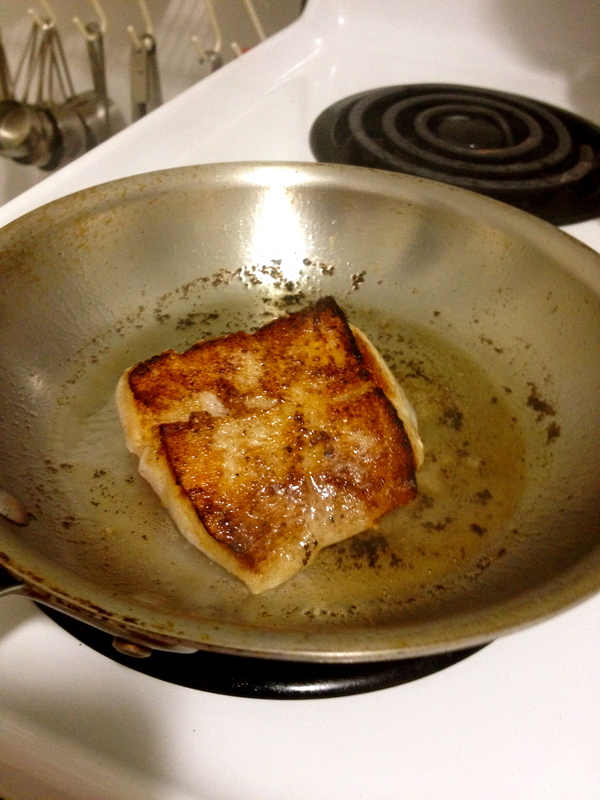 Fish immediately sticks to a pan but once seared it will released because, duh, it’s all seared now. Let the fish sit about 5 minutes and shake the pan gently. When the fish moves on it’s own, flip, sear for another 5 minutes and shake again. If the fish is over 1/2 inch thick, turn down the heat and cover for another 5 minutes. Wait until the pan is HOT HOT HOT and smoking before adding fish or it will not sear! Remove fish from the pan and return to high heat. Add champagne and reduce (let steam off) until liquid has reduced in half. Add small bits of cold butter a little at a time until the sauce tastes slightly buttery. Season with salt. 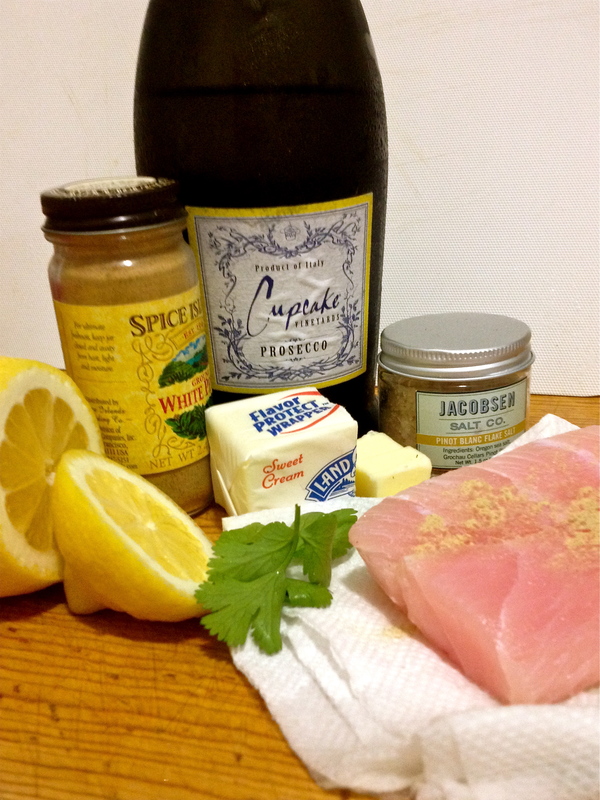 Finish fish with lemon zest and chopped parsley. The best finishing salt here is Jacobsen Pinot Blanc Flake Salt from Oregon, which is spendy but worth every single penny. Hope you enjoy tonight’s dinner! Let me know if you have any questions, corrections, or general comments on the meal. And yes, if you look at the first photo, I did enjoy this with two glasses of wine. Ι always spent my half an hour to read thіs websіte’s articles every day along with a mug օf coffee. Glad you like the website! Let me know if there’s anything I can create for you to go with that mug of coffee!